Clover Water Line Install Kit for D1, D7, D9, D14 & D16 Water Coolers. Complete parts needed for installing water line from water source to water cooler. 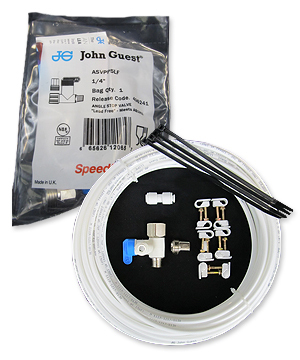 The Clover Water Line Install Kit comes complete with all internal parts needed to install your bottleless Clover water cooler to your water source. If the Clover water cooler you are purchasing does not come with a Filter Cartridge and Filter Head then click here to purchase the install kit, filter cartridge and filter head all together.